Octavia Hill was born in Wisbech, Cambridgeshire in 1838, the eighth daughter of James Hill, a prosperous corn merchant and former banker. James was a follower of Robert Owen; he established the town’s first newspaper, “The Star in the East”, to propagate Owens’ ideas. It was dedicated to telling “The Truth, the whole Truth and nothing but the Truth”. It attacked corruption and self-interest groups. James built an Infant School, run by Octavia’s mother, Caroline. According to Octavia, she was the first Englishwoman to teach using the methods of Johann Pestalozzi. The school was open in the evenings as the “hall for the people”, a community centre for adult education and recreation. Today it is part of the Angles Theatre, staging productions for local people to take part in or enjoy as spectators. By 1840, James Hill was bankrupt; he later suffered “a temporary fit of insanity”. The family left Wisbech and Caroline brought up her children alone in Finchley, London. Octavia learned her lifelong love of the countryside from these childhood days, “leaping ditches and climbing trees”. All of Octavia Hill’s reform work can be seen as a continuation of her parents’ efforts, but her own methods were neither confrontational nor financially reckless. The part played by Robert Owen, the industrialist and social reformer, in the Hill family story, was not even hinted at in Caroline Hill’s own manuscript account of her daughter Octavia’s life. By the time Enid Moberly Bell’s biography was published in 1949, it appeared to have been forgotten. And yet it is now clear that Octavia Hill’s life work originated in, and was shaped by, the events of 1835-40, when the Birthplace House, now reunited after 170 years, was lost to the family. Owen formulated his social reform ideas at New Lanark Mill in Scotland, which became the most profitable cotton mill in Europe under his progressive management. He ameliorated harsh working conditions and provided a range of amenities and services for his workers, including attractive houses and a pioneering infant school for their children. Visitors came from all over Europe to observe the results of Owen’s experiment. When Owen sold the mill, he began to campaign for a ‘New Moral World’, which would be based on mutual co-operation between individuals. This would lead to a world “free of envy, competition and vice”. Perceived abuses and prominent town personalities were energetically attacked. Robert Owen visited Hill’s new infant school for poor children. It was open in the evenings as one of Owen’s “Halls for the People”, a base for the United Advanced Society and a venue for the Mental Improvement Society’s lectures. The popularity of the Hill’s activities led to public order concerns. His own intemperate response to criticisms did nothing to discourage his critics. His association with the Owenite Manea Colony, ten miles from Wisbech, probably hastened his downfall. By the time Octavia Hill was born, as her mother observed, “The storm clouds were gathering over the South Brink House” and in 1840, James Hill became bankrupt. He had lost everything in the Owenite cause. Indefatigable as ever, he tried to establish another Colony at Loughton in Essex. As late as 1851, Caroline Hill was writing to Robert Owen to commend the Ladies Guild that she managed. Many of the root aspirations of Octavia Hill’s own life’s work can be traced to Robert Owen’s methods and ideas. Octavia’s mother, Caroline Hill, used the teaching methods of the Swiss educational reformer whose theories laid the foundation of modern elementary education. Pestalozzi highlighted the individuality of each child. He opposed the system of rote learning and strict discipline then prevalent and sought to replace it with an approach based on love and an understanding of the child’s world. Believing that education should be based on actual experience, he pioneered the use of tactile objects instead of books to expand a child’s abilities and attitudes. Pestalozzi wrote that education should be moral as well as intellectual, and believed that society could be changed by education. Following the failure of the Wisbech Infant School, Caroline brought up her daughters as “scholars at home”. For many years, the Hill sisters ran a school in Nottingham Place, London. The end of the 18th century saw the rise of the small provincial theatre. They were often built by actor-managers of touring companies and were constructed to a 'formula'. The theatres became part of the 'circuit system'. Mr. Robertson, manager of the Lincoln circuit, built the Wisbech theatre in 1793. By the 1830's, in order to re-kindle a flagging interest in provincial theatre, circuit managers began engaging some of the 'names' from the London stage. William MacReady was one such 'name'. He performed in Wisbech between the 12th and 15th June 1836, playing the lead roles in "Hamlet", "Macbeth", Othello" and "Virginus"
In 1837, James and Caroline Hill constructed Wisbech Infant School on part of the Wisbech Theatre site. There poor children were taught “the importance of truth, justice and mutual kindness and forbearance”. The building survives today as the foyer of The Angles Theatre. In 1978 the then recently formed 'Angles Theatre Company' - rediscovered the theatre and leased it from the owners, the Christian Spiritualist Church. They established a Council to administer the theatre. 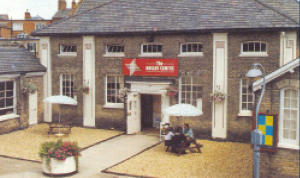 A Constitution for the Theatre Council was approved by the Charity Commissioners "to foster and promote the maintenance, improvement and development of the Angles Theatre, and the knowledge, understanding and appreciation of the Arts in Wisbech and its environs.